First, you need to register for a free account. 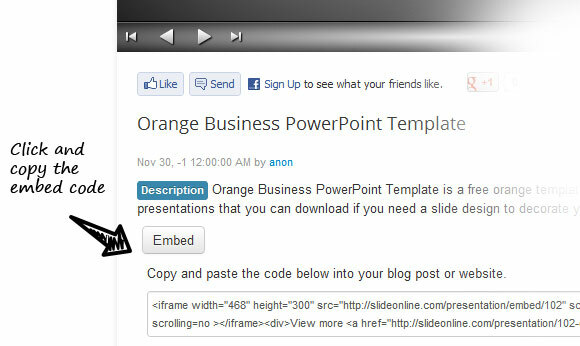 Then you can upload your PowerPoint .PPT file to your free account. Now, wait until your presentation is queued and converted to a format that Slideonline can understand, and finally go to your presentation page. You will receive instructions by email and the target URL as soon as you publish it to the web. In the presentation page, you can see an Embed button. If you click it, the HTML code to embed PPT into any webpage will be displayed. Copy and paste this code into your HTML page, WordPress post (use HTML view) or any other web page and then you will see the slideshow running in your website so your users can play it.